An early 1950's Frank Sinatra signature. Someone taped an old photo of Sinatra to the paper. You can tell by the age of the photo and glue stain the photo was applied al least 50 years ago. The signature is clean , unaffected by the applied photo. A real beautiful Authentic autograph from the greatest singer and entertainer of all time. With over 90% of Sinatra autographs begin fake, this is a great opportunity to own a Guaranteed Genuine one. 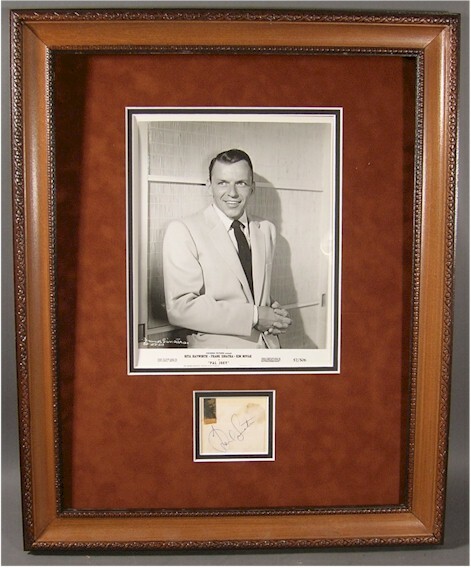 Beautifully framed with an original photo from "Pal Joey", a great shot of a young Sinatra. A real treasure to be proud of in your home or office. OR, the absolute ULTIMATE gift! Framed to 14x18". (we ship without the glass due to high risk of breakage).